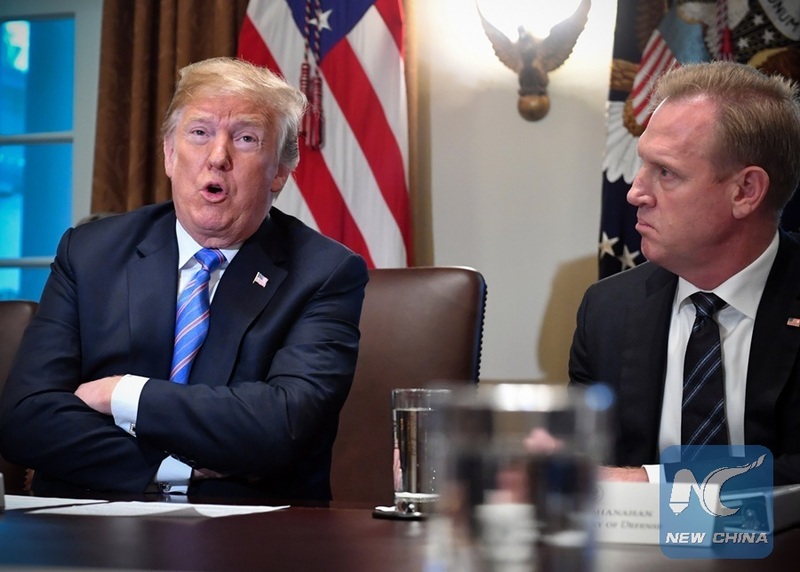 WASHINGTON, Jan. 1 (Xinhua) -- Patrick Shanahan officially took over the Pentagon on Tuesday as acting U.S. secretary of defense. "Under the direction of President Trump, the Department of Defense remains focused on safeguarding our nation," Shanahan said in a statement released on New Year's Day. "As acting secretary of defense, I now look forward to working with President Trump to carry out his vision alongside strong leaders including the service secretaries, the Joint Chiefs of Staff, the combatant commanders, and senior personnel in the Office of the Secretary of Defense," he said. He spokes highly of his predecessor, Jim Mattis, saying that "it has been a privilege to serve as his deputy secretary." Mattis announced resignation on Dec. 20 over policy disagreements with Trump, including whether to withdraw U.S. troops from Syria. The 68-year-old former Marine Corps general had planned to leave at the end of February but Trump named Shanahan as the acting Pentagon chief before Christmas, forcing Mattis out earlier. In his farewell memo Monday, Mattis encouraged all Pentagon employees to "keep the faith and hold fast." Shanahan, 56, became deputy secretary of defense in July 2017. The former longtime Boeing executive reportedly has strong relationships with both Trump and Vice President Mike Pence but is set to face questions over his lack of foreign policy or government experience. The Pentagon also has Charles Summers as new spokesperson on Tuesday, a day after spokeswoman Dana White announced her departure.